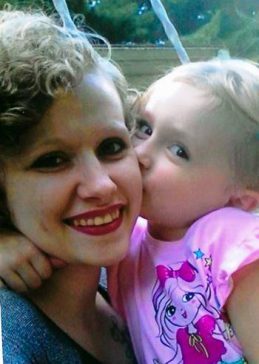 Natasha Rose King, 23, of Galveston, Ind., formerly of Frankfort, died March 19, 2019 at St. Vincent 86th St. She was born on July 7, 1995 in Frankfort, Ind. to her birth mother, Michelle King. Her parents are Sean & Valerie Galvin. Natasha was a beloved daughter, granddaughter, sister, niece, mother and friend. She was beautiful inside and out and had a loving, care-free spirit. She was very compassionate to all who loved her. Natasha’s pride and joy was her beautiful daughter, Elaina Rose. Her most passionate role in life was being her mother. She loved animals and she spent time volunteering at the Clinton County Humane Society and participated in dog obedience in 4-H. Natasha was always very adventurous and as a young girl was a brave tree climber. She loved to skateboard and participated in a skateboard competition. She also participated in youth theater. After receiving her high school diploma in Madison, Ind., she worked as a waitress in Kokomo, Cracker Barrel, and Red Lobster. She also aspired to become a tattoo artist and was very artistic. Natasha was smart, quick-witted, funny, and fearless. We will forever miss her joyful singing and how she memorized every song, her warm smile and bright-shiny face, her ocean eyes and her wavy curls. She will be deeply missed by all that knew and loved her. Natasha was a blessing to many in her short life and a hero in death as she gave the gift of life to many in need by being an organ donor through the Indiana Donor Network. Visitation will be 4-7 p.m. Thursday, March 28, 2019 at Goodwin Funeral Home, 200 S. Main St., Frankfort. Funeral Services will be 10:30 a.m. Friday, March 29th at the funeral home. Burial will be in Hopewell Cemetery. Please consider making a donation to a fund for Elaina Rose, c/o Goodwin Funeral Home. Parents: Sean & Valerie Galvin of Frankfort, Daughter: Elaina Rose Johnson of Galveston, Elaina’s father, Joshua Johnson and his parents, Tonya & Brad Herron, and family, 2 Sisters: Annabelle Galvin and Stella Galvin, Paternal Grandparents: Chris & Jim McDaniel, Maternal Grandparents: Ronald & Stella Carter, Aunts & Uncles: Jennifer Carter, Julia Carter, Morris Carter, Mia Carter, Angie McDaniel, Rodney McDaniel, Trish McDaniel, and Nicholas McDaniel, Cousins: Forrest, Wyatt, Lilly, Jennifer, Sasha, Jessica, Steven, Summer, James, and many extended. She is also survived by an extended family and friends. She was preceded in death by great grandparents, George and Shirley Galvin.